On Lag B'Omer two events are commemorated: the day that the plague which killed almost all of the 24,000 students of Rabbi Akiva stopped, and the day that Rabbi Simeon Bar Yochai died. Both stories contain miraculous elements, but one thing which is certain, is that both Rabbis lived in the Galilee. Rabbi Shimon Bar Yochai was one of the five disciples of Rabbi Akiva who survived the fateful plague. He in turn became one of the most famous rabbis of all time, wrote the mystic book the Zohar and lived in a cave in the small Galilean city which is now Peqi'in. Rabbi Shimon Bar Yochai's grave is in Meron. A large amount of information about these rabbis and others can be found in the Mishna and Talmud. The Mishna was compiled around the year 200 by a famous rabbi, Rabbi Yehuda Hanassi, who lived in Bet Shearim and in the last 17 years of his life, moved to Zippori. In Zippori he compiled what was to be his life work, the Mishna. Also the Sanhedrin, the Jewish court of justice, was moved to Zippori. What were all these Jewish sages doing in the Galilee? Well, this was a result of Jerusalem and Judea being closed to Jews. After the Temple in Jerusalem had been destroyed, Jewish teachers looked for alternative ways of worship. They set up centres of learning in Yavne, and later went to the Galilee. The northern part of the country was still thought to be free of persecution during the reign of Hadrian (117-39) and after the Second Jewish War, when Jewish practice became forbidden altogether in Judea. The dramatic events directly influenced the lives of religious men. Rabbi Akiva, for instance, lived around 70 CE and witnessed the destruction of the Temple in Jerusalem, which practically ended the First Jewish War against the Romans. Rabbi Akiva also played a role in the Second Jewish Revolt, and fought side by side with the leader of the rebellion, Bar Kochba. They were both killed in the final battle in 135 BC. Not all Jewish rabbis were as fanatic or took up a sword as Rabbi Akiva. In fact, most religious leaders and their followers were pacifists, and seemed to have conformed to the Roman rule, as long as they were left in peace and could study the Torah without disturbance. Rabbi Shimon Bar Yochai, as another example, did not have any love for the Romans at all and because of several disputes with them, had to flee. It is said that he hid from the Romans in a cave for 13 years. This cave may still be seen today in modern Peqi'in. Other rabbis were not prepared to risk their lives or live hermit-like in a cave. Many found a shelter in Zippori, which assumed enormous importance as a centre of Jewish learning. This prosperous town had collaborated with the Romans in the First Jewish War, and because of its undisturbed tranquillity had a thriving Jewish community from the first Century onwards. This is probably why Rabbi Yehuda Hanassi and a host of rabbis, students and Jewish academies settled there in the second Century. During this time the city rapidly expanded and might have numbered about 12,000 people. The Romans never destroyed Zippori and therefore it gives one of the best impressions of Roman and Jewish life in Israel in the first centuries. Whereas other sites are mostly famous for tombs or old synagogues, Zippori has Roman streets and buildings. In fact, a whole antique city is dug up. Zippori did not start life as a city in the Roman era. It existed already in the Second Temple Period. The first century CE Jewish historian, Josephus Flavius, called it "the ornament of all Galilee", obviously a flattering term but whether he meant that the city was strong or beautiful is unsure. 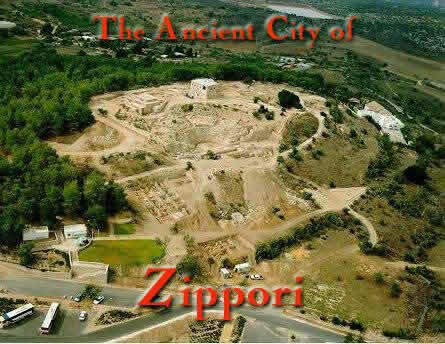 The city was named after the Hebrew word for bird, 'zippor', because it seems to soar from its position on top of a hill. King Herod liked its strategic position and made it his capital, when he was governor of Galilee in the beginning of his career. However after Herod's death the city was burned during a conflict of local leaders. Herod's son, Herod Antipas, rebuilt the city. Sometime afterwards, Zippori's population became predominantly Jewish. Even so, the city showed its remaining loyalty to the Roman rule by renaming itself during the reign of Hadrian as Diocaesarea, a reference to Zeus and Caesar. In the Byzantine era, starting in the fourth Century, also many Christians came to live in Zippori, co-existing with the Jewish population. The Arabs conquered it, until the Crusaders, who built a huge fort on top of the hill, which is still standing today, ousted them in turn. The Crusader armies moved out from Zippori to fight the sultan Aladdin in the battle of Hattin in 1187, where they were badly defeated. The Arabs renovated the fort, but the settlement on the hill became deserted after a while, and moved to the nearby Zippori village (now a moshav). This resulted in a perfect antiquity park on the hilltop. Next to the entrance road to old Zippori stands a tomb. It is said that the grandson of Judah Hanassi, Rabbi Judah Nessiah, is laid to rest here. But others argue that it is a Roman mausoleum. Like in other sites with remains from the Roman period, it is often difficult to distinguish whether Romans or Jews inhabited certain buildings. The dominating architecture and style in the first centuries was Roman/Greek and all ethnic groups built in this style. Only in the decorations can it sometimes be seen that Jews built it, for instance in the synagogue in Zippori, which has a mosaic of a menorah. The antiquities in Zippori are laid out along a route. The first stop is a Roman theatre tucked into the slope of the hill. It is rather damaged and with 4500 seats it is not as big as some theatres in Israel, but it still gives an impression of what Zipporian theatrical life must have looked like. The performances in the Roman theatres at the time, which consisted of light farces and animal dancing, were frowned upon by observant Jews. The Talmud declares that "blessed is the man who does not go to the theatres and circuses." Unfortunately it is not known what Zippori's Jewish citizens thought of the theatre in their midst. The second point on the route is a lookout. Down the road is a Convent which also houses a (Arab) girls' school, more to the left are the remains of a Crusader church, and at the bottom of the hill the possible tomb of the grandson of Rabbi Yehuda is spotted again. From the lookout we reach the Roman town, the Cardo (main street). Many houses from the Hasmonean and Herodian period are excavated and work is still in process. The most notable feature is the ritual baths (mikves) in each dwelling, which shows they were inhabited by Jews. The baths look like round cement tubs. Each house was built round a private courtyard and two stories high. The crusader fort marks the top of the hill. From the top of 'The Citadel' visitors can check for themselves why the city received its name after a bird. There is a 360 degrees view of the environment. 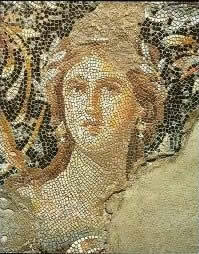 Interesting antiquities are to be found in the form of mosaics in the Roman and Byzantine villas. Next to the Crusader fort a large mansion from the Roman period from the third Century was dug up. It is not known who the inhabitants were and whether they were Jewish or Roman, but they must have been distinguished and affluent citizens. The mosaics lie in the dining room. The table(s) would not be placed in the middle of the room as we do in modern times, but couches were put at the sides so people could enjoy the mosaics while eating. The mosaic is expressly laid in a T-shape so the undecorated places could be used for the couches. Archaeologists are still at work in the "Lower Town" of Zippori, which was occupied from the second Century, and could well have been the quarter in which the Jewish sages lived. A long street, restored in Byzantine times, cuts through geometric blocks of houses and clearly shows the tracks of heavy carts which must have pulled innumerable times along the bustling colonnaded shops of the Roman market on both sides. Other mosaics are on display in the villa of the Byzantine period, a bit further southwards. Again it is unknown who lived in this "House of the Nile Festival", but its owners were surely interested in hunting. Smaller mosaics depict amazons, mythological hunting women who are said to have cut off their right breast so they would be better at handling a bow. (In the mosaics there seem to be no breasts missing.) Another mosaic is of a centaur, a fierce creature made up of half man, half beast. The largest mosaic displays scenes related to the Nile. In the upper right corner the river is born from the mouth of a fable monster. A female goddess, Egypt, rests by the river. Animals, crops and people come to life, displaying the fertility of the water. A man and woman (the man climbs onto the back of the woman) stand at a 'nilometer' to measure the water level, which is this year exceptionally high, giving cause for rejoicing. Further down there are depictions of Alexandria, galloping horsemen and on the bottom are fighting animals. Two mice (just under the city gate) try to escape from a leopard: one of the mice disappears half out of the picture, only his hind legs and tail are left in the air! Towards the parking lot, a synagogue from the fifth Century was dug up. There were reputed to be at least 18 synagogues in Zippori in Talmudic times, but so far this is the only one which is found. On the floor lie mosaics, among which a zodiac and a menorah. The orientation of the building is unusual since it does not point toward Jerusalem. The hall is divided into two by a row of five columns. The mosaics in the biggest hall consist of seven panels. The first is badly damaged, but would have shown Sarah with Abraham offering food to the three visitors (Gen. 18). The second is the sacrifice of Isaac. The third part is a zodiac, with the figures representing the four seasons standing in the corners. The zodiac signs are written in Hebrew, but next to the sun is a Greek inscription. The fourth panel contains the shewbread, the daily offering and the first fruits. In the last the pigeons are tied to the basket so they cannot spoil the contents. The fifth is dedicated to the Consecration of Aaron. To the left are the sacrificial bull and ram (Exodus 29: 10-15). The sixth panel depicts the ark in which the Torah scrolls were stored, flanked by the menorah. The seventh panel shows two lions and an inscription on a garland. The overall meaning of the mosaic of the zodiac flanked by Jewish stories and symbols is that the fate of the descendants of Sarah and Abraham is determined not by the stars, but by God who rules the zodiac. Like in his promise to Abraham, God will take care of the fate of his children. 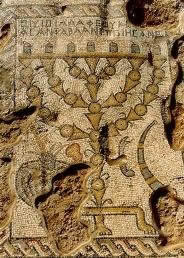 The narrative episodes in the mosaics have not been found in any other synagogue of this period in the Land of Israel, and maybe they point to the special culture of Zippori, where (biblical) learning was perhaps more developed than in other parts of the country. The inscriptions of donors who contributed to the synagogue are thought to be a guide to the social makeup of the Jewish citizens of Zippori. The names in the picture panels are all in Greek, whereas the ones in the plain aisle next to it are in Aramaic: maybe the Greek-speaking Jews in Zippori were wealthier than the ones who only spoke Aramaic. By the way, Hebrew was not spoken at all in this period, but only written and used for religious purposes. The dominating languages were Greek and Aramaic. Outside of the city are an aqueduct and a large water reservoir, showing how Zippori took care of its water supply fed by its springs. Zippori is an interesting spot to visit both from an archaeological and historical prospective.